2) There are a lot of people wearing skinny jeans at my church. 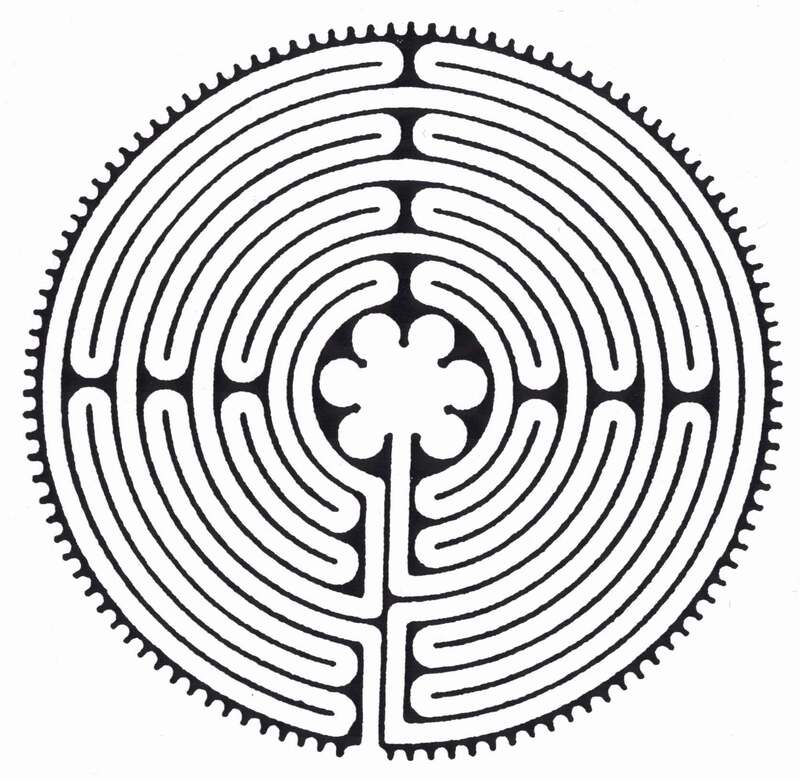 Brad’s tattoo is based on a real labyrinth in the basement of our church. 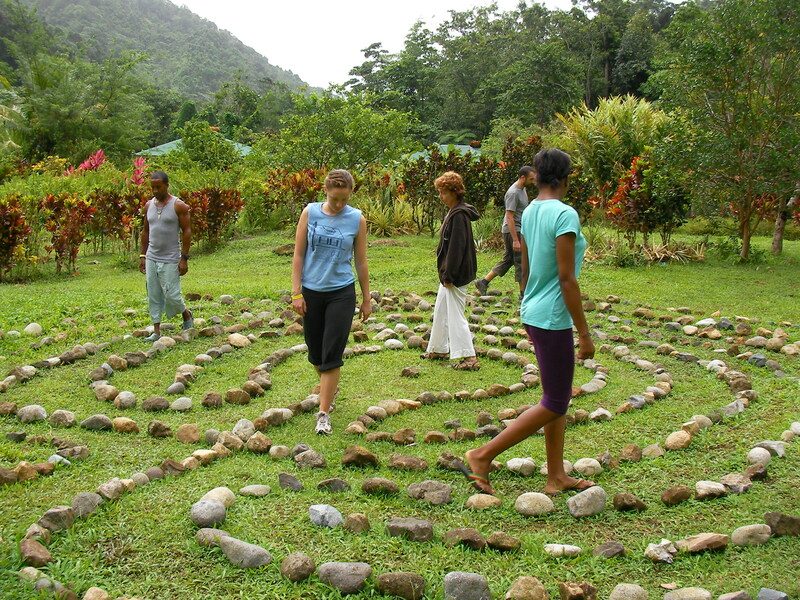 During one service, we all went downstairs and walked the labyrinth together silently as an act of worship. The labyrinth looked a lot like a life sized maze painted on the floor with one difference: there were no dead ends. All labyrinths have one path to the middle, and one path out. I have thought a lot about this experience because I would love to live a “labyrinth life.” A life in which I recognize that everyone around me is on the same level as me, on a similar journey. A place in which I may be led by people that are more experienced than me, but they still see me as an equal and a comrade. A place in which I validate my life journey just as much as my neighbors, and vice versa. Unfortunately, the world we live in is a world of ladders. Clunky, falling over ladders, with people scrambling to get to the top, stepping on each other in our constant movement up or down. Humans by their very nature rank things. -We rank people by gender, race, wealth, or intelligence. -We rank people by seeing who is appointed “above us”, which often isolates on both sides. I have heard that head pastors are often lonely because they don’t have anyone to talk to about their own problems. -We rank when we look for a partner, discerning sometimes within a few minutes whether that person is on about the same level as us in their attractiveness, job status, religion, level of education, likability, and confidence level. Rene Girard, the anthropological philosopher, has a theory about humans and their ladder like ways. He coined the term mimetic desire. The basic theory is that there is a triangulating rather than a direct relationship that humans have with most things in the world. We rarely ever directly want anything…we want something because someone else has it. According to this theory, our motivation often stems from an inward desire to be like someone else or to compete with someone else. Comparison is almost always a factor. We see this pattern even in the first years of life when a child wants the toy of another child vehemently more than any other in a room full of toys. And yet, I have worn them ever since. Any hint flare in my jeans makes me feel like I am in the wrong decade. In fact, I will probably be wearing skinny jeans until I see the upcoming “Yuccies” (who evidently are replacing the dying out class of hipsters) convince me that I should pin roll my non skinny jeans like I did in middle school. This is a classic case of Girard’s theory. The next step of the theory states that in order for similar people groups to escape their competition towards one another, they will find a “scapegoat” outside of their group to dehumanize and retaliate against in order to bond with each other. First they wanted the same object, now they want to fight against the same enemy. You can see this in things as innocent as a football game and as tragic as a genocide. We have seen this phenomenon of scapegoating explode in the modern digital age, where social media has become a mutual agreement/ scapegoating machine. This system of competition, rivalry, and classification inevitably puts us on ladders, where we rank everything from our gender to our attractiveness to our shoe choice. How do we escape these ladders encircling us telling us that we are not good enough, that we are better than, that we are deserve more, that we deserve less, that we are all very separated and very alone? To bring this into my personal life, the most difficult church experiences I’ve ever had have been when hierarchal leadership has been in place, in which it was obvious that I was not as important as other people in my community and my leaders had more say over my decisions than I did. No leaders at all can result in spiritual anarchy, which is not healthy. But power hungry leaders can quickly lead to spiritual slavery. The trick is to find a balance between the two and to look for servant leaders, to be servant leaders. After many years in that dance, I now look for situations where my leaders lead me, but they also see me as walking on the same level that they are, where we can learn from each other. Do you realize what a potent statement this was, especially in a time where religious, economic, and gender rankings were even more stark and volatile towards each other than they are now? Much of Paul’s writing is based on his revelation that the message of Jesus was a message for everyone, Jew and Gentile alike. If we were to live by this verse and truly see the people in our lives as one, it would empower us to bring value and validity both to our neighbors, no matter how different they looked than us, and even contribute to our own self worth. How has ranking been detrimental to your own self worth? Are there people that you have scapegoated or you have seen other people scapegoat? Have you ever been in ladder leadership situations that were harmful to your well being? How has Christ’s love taught you to love people beyond their gender, ethnicity, lack of Tom’s shoes, etc? I have been in ladder situations in spiritual settings that were unhealthy, but I also agree with your statement that total lack of leadership/ anarchy isn’t healthy, either. I’m not actually sure if it’s the ladder that’s the problem; maybe it has more to do with the ways we use our positions on the ladder to step on each other, try to prove ourselves to God, etc. I always love the place in That Hideous Strength where C.S. Lewis wrote that equality is medicine, not food. He wrote that we need it to guard one another from our greed because we are fallen, not because equality was ever meant to be the deepest thing. I like the labyrinth idea because the one thing it has us all following is the WAY. Incredible post kate. You always blend humor, personal experience, and truth so poeticallly. Re your post…God opened my eyes up to this gradually over the years, but especially through the book Searching for God Knows What by Don Miller. Truly paradigm shifting. Our entire world culture/society is based on comparison and ranking and a tendency to separate (so opposite of Jesus’ prayer for his Church). Keep up the awesome work beautiful sister! Oh here is the comment that you mentioned! I missed it for some reason… Thanks for the kind words! I am reading Searching for God Knows What again per your suggestion and really like it!